Home/CO.STARTERS GENERATOR FOR AGES 10-19. SCHOOL, HOME-SCHOOLING, CHURCH AND COMMUNITY GROUPS. Young entrepreneurs are the future of business and innovation in Australasia! Entrepreneurship is a skill that is learned like any other and entrepreneurs can start at any age. Learning about starting businesses or developing innovative ideas builds resilience for the future world of work. Many jobs of the future have not been identified as yet, but we know if we build creative mindsets in kids and teens, they will become future shapers! There is a lot of good research about why kids and teens should have the opportunity to learn and have fun with entrepreneurship while they are naturally curious and creative. We can look at great programs operating in other places in the world and the impacts on kids and their future. An entrepreneurship program “equips children with essential foundational knowledge and skills such as emotional intelligence and risk taking; it also develops their appreciation for self-employment opportunities.” The Conversation January 2018. Kids and teens have passions and dreams and we should teach our kids how to be entrepreneurs says entrepreneur Cameron Herold in this interesting personal reflection TED Talk. What did our first group of teens have to say? Generator is the flag ship 28 module program for 10-19 year olds that our team delivers over a 9 week period for 2 hours per week or a 7 week period for 2.5 hours per week. Modules form four key areas of ideation, discovery, building and launching. Generator is suitable for schools, home schooling, TAFE and private RTOs, councils, Church and community groups. The group generates ideas and forms teams to generate, discover and test the best entrepreneurial ideas. 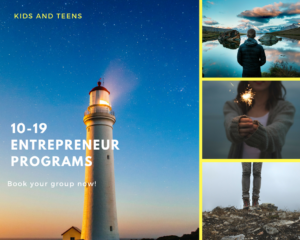 Kids and teens learn important skills from highly experienced entrepreneurs and develop self confidence, problem solving, and the successful entrepreneurial mindset. Our team of facilitators includes highly experienced educators (Schools, TAFE, Uni), entrepreneurial experts and certified small business mentors. COSTARTERS_Generator Flyer. Minimum group size 10. $464 (GST Inclusive) per child/teen. Where there are two or more children in one family attending we provide a 10% discount. This program can be delivered over 7 weeks @ 3 hours each week, as a week long school holiday program, or other negotiated flexible method. Contact the CO.STARTERS Manager to discuss and book a group from your organisation! What is 24 Hour Generator? This program is a 24 hour fun adventure normally delivered over a weekend or during school holidays. It is suitable for ages 10-19 and parents are most welcome to attend for free. Small businesses come in with a problem for the students to solve. Kids and teens do the “reverse pitch” of the problem on the first night. Then over a full day, teams work through the problem and present their pitch to solve the problem at the end. Minimum group size 20. $264 per child/teen which is inclusive of materials. Contact us to discuss and book a group from your organisation!